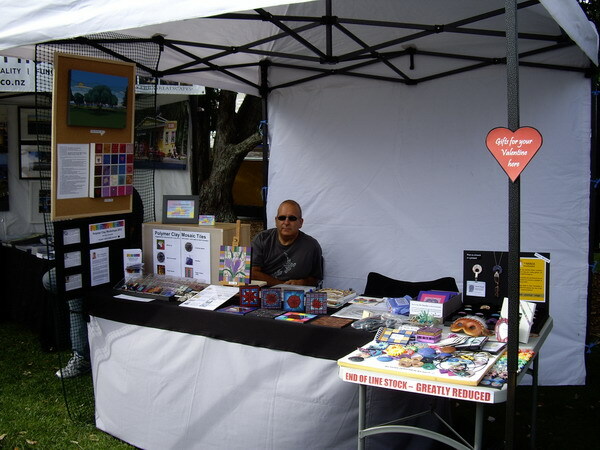 The weather turned out to be good for this years Auckland Anniversary Art & Craft Market at Mission Bay, bringing lots of visitors to the market. My display advertising the 'Introduction to Polymer Clay' and the 'Polymer Clay Mosaics' workshops that I will be running through 2012 attracted a lot of interest. I hope this will follow through with some bookings. The fact that I was actually working on making a mosaic picture seemed to draw in by-standers. It was nice to have some 'regular customers' return to buy from the 'clearance' table, where I was selling off trial pieces and the last of my stock of Art-Brooches and HANGAs. I no longer intend to make these, as this year, I will be concentrating on teaching workshops and creating larger scale mosaic artwork. 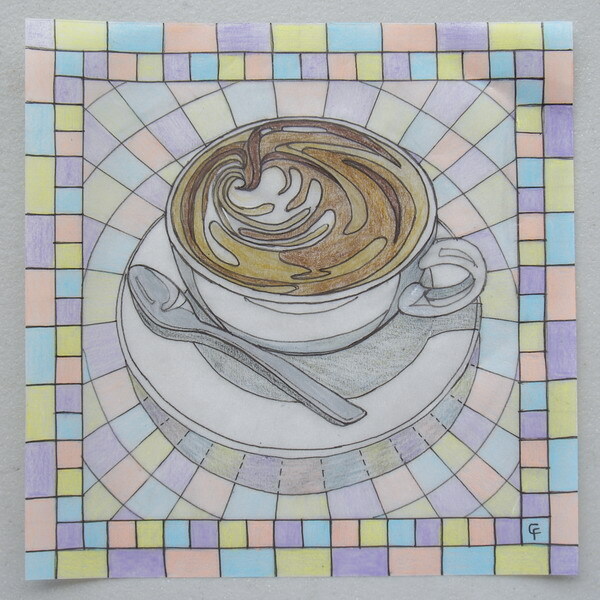 'Coffee Time' is the title of my latest polymer clay mosaic, which I have sketched out here. I intend to be working on this mosaic at this years Auckland Anniversary Art & Craft Market at Mission Bay. 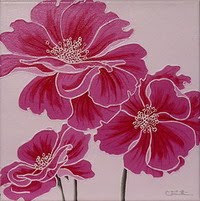 I am hoping that the 'work in progress' will attract some interest in my display and the workshops I will be advertising for 2012. If there is anyone in Auckland who wants to learn more about polymer clay, my Introduction to Polymer Clay Workshop could be just what you are looking for. 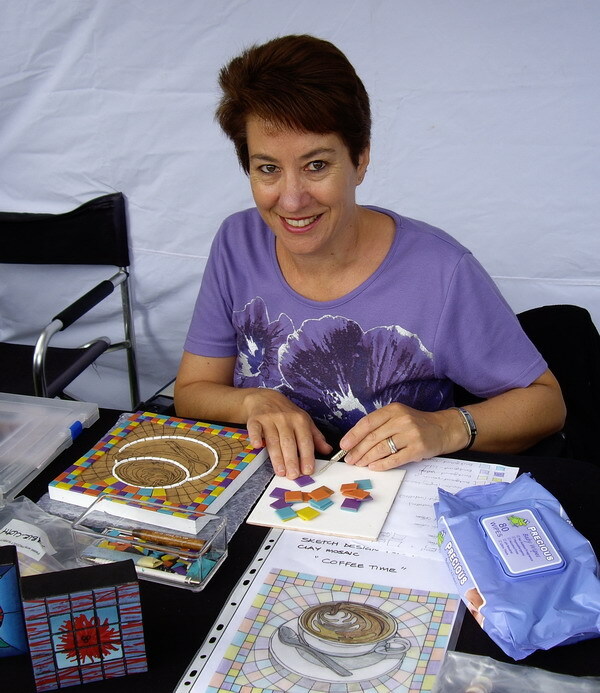 If you like mosaics but do not want the expense of buying traditional mosaic tools and materials, learn more about an alternative on my Polymer Clay Mosaics (Introduction) Workshop. More details can be found under the 'WORKSHOPS' tab - or come and see me on the 30th at Mission Bay (I hope to be in my usual spot, Row 1). 'Studio' is used with 'artistic licence'. I have been working on my folding craft table in the apartment - a far cry from the custom built studio at the end of the garden that I once had in the UK. Several house moves later and then the decision to emigrate to New Zealand meant my whole art and craft set up, including tools and materials, was greatly condensed down to a few large cardboard shipping boxes and my trusty folding craft table. As we are currently living in a rented apartment, any furniture has to be free-standing so, in an attempt to improve my creative working space and make the apartment look more tidy, I have invested in a new desk and a large bookcase, which will become my very 'compact studio'. The photo shows this transformation in progress. The idea is to eventually have some sort of drop down covering on the front, to hide all the clutter when it is not in use. The immediate advantage I have noticed so far is having my pasta machine at a height suited for use when standing up. It also means that I can screw the machine down to the shelf it is on, rather than relying on the clamp to hold it in place, which tends to work loose. 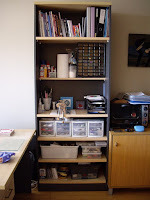 I am not sure when this project will get completed, as I am busy preparing teaching aids and advertising material for my 2012 schedule of workshops, but I will eventually post a photo of the finished look. As 2012 begins, I am looking forward to a year of new opportunities. Towards the end of last year, I made the decision to try a new approach to creative enterprise. 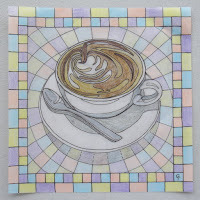 I intend to focus on teaching polymer clay workshops/classes and, to support this, work on selected mosaic artworks to showcase my skills as a polymer clay mosaic artist. This will be quite a change from my previous production of items in volume, such as the HANGAs and Art-Brooches. 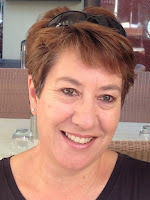 I am fired up with enthusiasm and hope this will show through in my work and teaching. HAPPY NEW YEAR - AND HAPPY CLAYING!